Inspire your senses with the sounds and scents of the Indian Ocean during your stay in one of The Chapman’s well-appointed rooms. 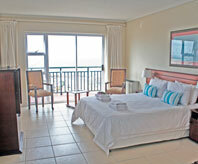 Standing majestically overlooking Algoa Bay, The Chapman offers panoramic sea views from all of it’s hotel rooms. 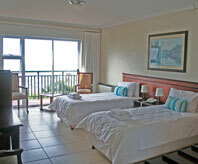 This sea-facing en-suite room consists of one double bed with a full private bathroom (with a separate bath and shower). 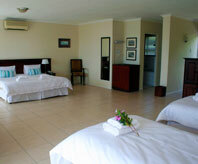 An extra single bed can be added to this room to accommodate a third guest. This sea-facing en-suite room consists of two single beds per room with a full private bathroom (with a separate bath and shower). Self-Catering Units, managed by The Chapman Hotel, are also available in a townhouse development situated next to The Chapman Hotel. The configuration of these units varies between one bedroom, two bedrooms and two bedrooms (with a Loft), with some of the units having two bathrooms and some having one bathroom. Wi-Fi Facilities are available through Internet Solutions and Alwayson.